By the 1920s, the Altoona railroad works employed 15,000 people, and by 1945, the Pennsylvania Railroad’s facilities in Altoona had become the world’s largest rail shop complex. Allegedly, a few workers from the railroad’s storied past haunt the Railroaders Memor­ial Mu­seum along Ninth Avenue. Paranormal investigator John Karle set up infrared cameras inside the museum Friday to prepare for a potential meeting with spirits later that night. The after-hours ghost hunt in the museum was the last event of the night for the first day of Altoona’s third annual Zom­bie­town USA Halloween festivities. Karle and his wife, Beth Ann Karle, of JABA (John Albert/Beth Ann) Paranormal investigations opened an investigation of the museum to about 20 people from 11 p.m. to 1 a.m. Friday. The cost was $40 per person. Proceeds benefit the Railroaders Memorial Museum. Karle limits the number of people who can attend to reduce noise and interference with paranormal activity. Another investigation is scheduled for tonight from 11 p.m. to 1 a.m. Tickets were sold in advance. “I was a huge nonbeliever un­til we ran into a 4-year-old spirit in 2013,” Karle said, adding it was at a historic tavern in Boals­burg. Now JABA has a 10-member team of investigators who conducts ghost hunts in private homes and public areas. Their equipment includes manual dowsing rods, infrared cameras, two radios changing channels at 300 milliseconds to pick up frequencies of ghost energy — one is set on AM and one on FM as a check against mistaking a radio station for a ghost. Another machine, Karle said, measures humidity, electromagnetic field and air pressure to support or refute something an investigator might see and suspect is paranormal activity. During JABA’s past visits to the museum, investigators have allegedly communicated with ghosts of a few former workers whose photos are in the museum. “We let people use the equipment. Some people really get freaked out by it. You can feel the energy moving through the dowsing rods,” he said. The ghost hunt is the final event capping the two-day Zombietown USA Halloween party. Family events scheduled through today downtown include live music in Heritage Plaza, laser tag and street vendors. The community-wide party kicked off Friday with an Alice in Chains tribute concert at the Railroaders museum. 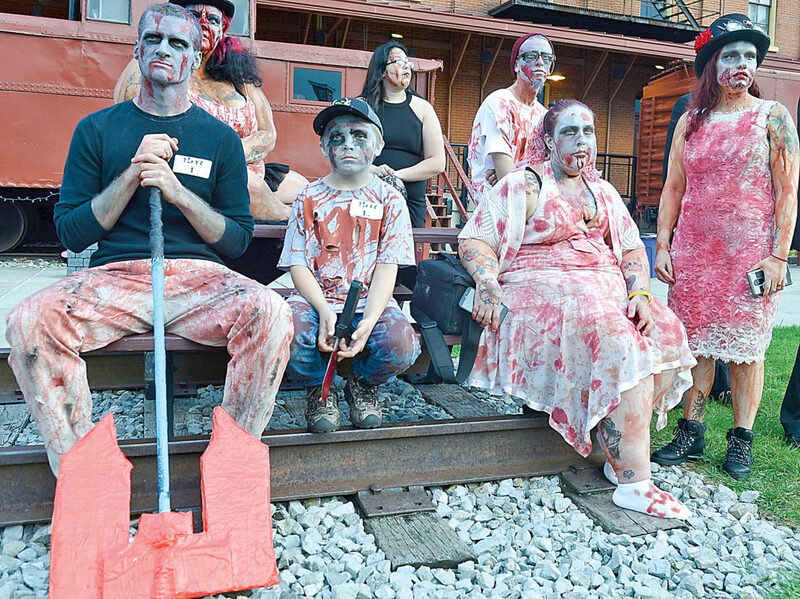 People dressed as zombies, including Jennifer Hall of Altoona, began to gather at the museum’s gates before the concert and zombie contest registration at 5 p.m. Friday. “It’s a lot of fun,” Hall said, wearing gruesome yet glamorous zombie makeup for the Zombie Prom. Museum Director of Marketing Sherry McCarthy said the concert typically draws between 300 and 500 people. This year’s Zombietown USA events mark the third year for the growing Altoona tradition. The weekend-long party was started by Lori Rupert, partner and web developer at the Altoona marketing agency NOVA6, in coordination with city officials. City Councilman Dave But­ter­baugh foresees the event attracting more people from out of town in the future. “I hope the event is a success for the community as a whole. A lot of people enjoy it very much. It’s a big Hal­­loween party. I can see it growing year by year. The organizers work hard on this all year round,” Butterbaugh said. The county’s designated tourism marketing organization, Explore Altoona, is a destination marketing partner for Zombietown USA, Executive Director Mark Ickes said. “The numbers of participants for Zombietown USA have increased, and I am very impressed with the variety of events, especially this year,” Ickes said.